Wow your guests at your Wedding Breakfast with a Bespoke Cake by Cakes for Special Occasions. Your Wedding Cake is a centrepiece at your reception and Cakes for Special Occasions have years of experience to make sure this is so. Want to incorporate the cake with a theme you have of your wedding or just to personalise it to your individual idea. 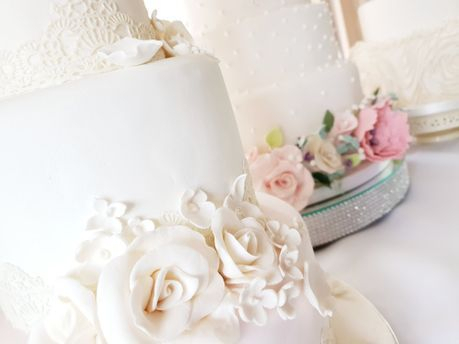 We will sit down with you and let you create your own personalised Wedding cake! Cakes for Special Occasions are always here to offer help and advice. You can choose from a variety of flavours from more of the traditional fruit to a range our premier assorted flavoured sponges and fillings… undecided what flavours to have? Then why don’t you let your guests have a choice of flavours by having a different choice in each tier of cake. 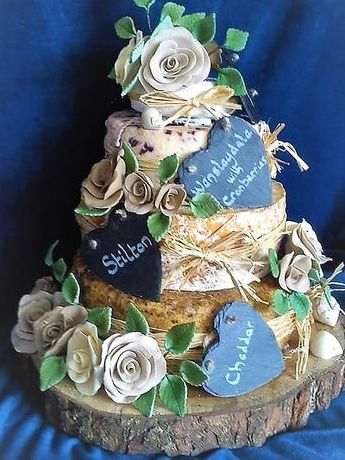 For those who have not such a sweet tooth but are not wanting to be left out then why not look at our Stacked Cheese Wedding Cakes. We have a local diary which supplies us with the cheeses ranging from the traditional cheddar's to the quirky white Stilton with strawberries & cream. Wedding Cake prices may vary on amount of serving required, flavours chosen and final designs. Consultation is by appointment only, cake tasting is available by booking in advance.